Blondie and Brownie: Pear Gruyère Cup Pies! 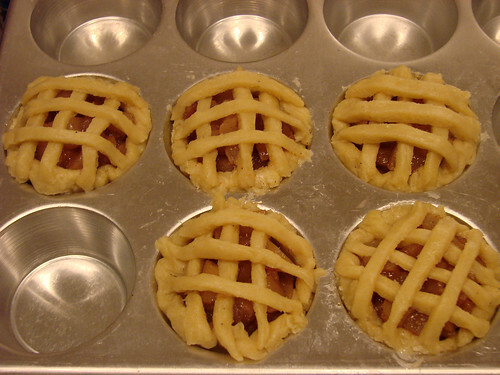 For the Cup Pies (or Cuppies as Lawman calls them), take your dough scraps (I had scraps from 2 pies in my freezer), defrost them and roll the dough out and fit into the little cups of a muffin tin. Reserving a little extra for lattices. 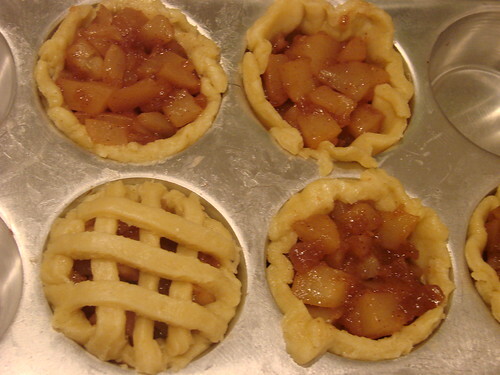 Dice two pears (or if you are making more Cup Pies prepare the filling as directed and dice the pears when cooled). 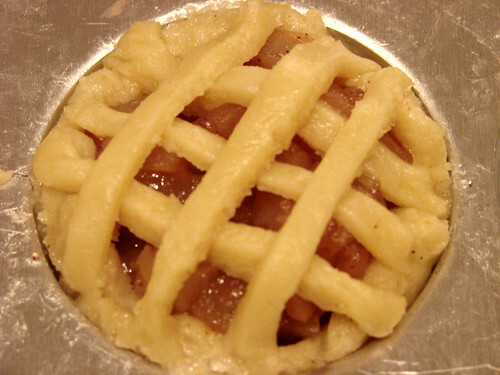 One the filling has cooled slightly, fill each little cup pie and using the rest of scraps, cut the dough into little strips for the latticework, you'll need 6 strips per pie. Bake for 15 minutes at 350 or until golden brown. 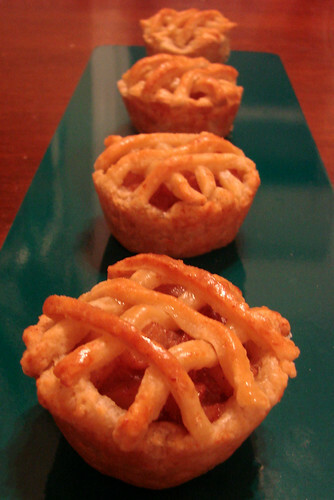 Cup Pies were also inspired by an episode of Pushing Daisies--sigh, did I mention that I love that show? Unfortunately it is in serious danger of cancellation. If you are a lover of the show (and/or if you enjoy when I make Pushing Daisies inspired pies), check out this online petition to ABC and the Save Pushing Daisies Blog. I'm still hopeful that Ned will have many more pies to bake and murders to solve in his future. On a happier note, what beautiful little cup pies! these are very cute pies. I am determined to actually go buy some Gruyère so I can make some of these myself! Perfectly adorable and delicious just like Ned. I will go join that petition and dream of making cup pies soon. Did you butter the muffin tin? How come your muffin tin looks so nice and shiny and my muffin tin looks like it was made by cave men?